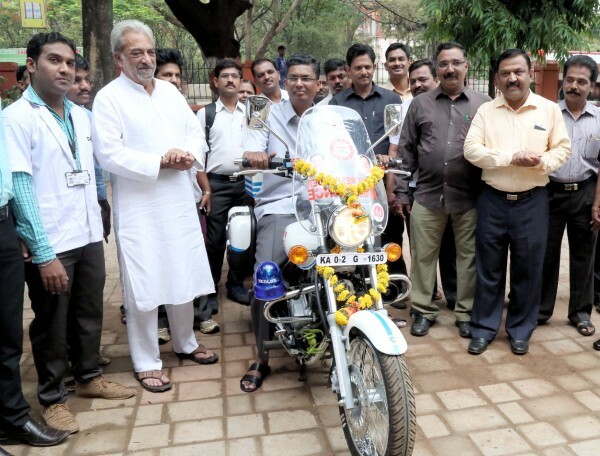 The much-awaited two-wheeler ambulances have hit the streets of Belagavi. The First responder bike ambulances are aimed at reducing deaths owing to road accidents, the platinum trauma care initiative is useful for negotiating heavy traffic in urban areas where it is difficult for four-wheeler ambulances to reach. The initiative will be implemented through GVK-EMRI, the organisation that runs the 108 Arogya Kavacha ambulance service. The bike ambulance rider will be a trained paramedic. The paramedic will reach the spot in ten minutes and give first aid and start resuscitation measures to save the victim till the four-wheeler ambulance arrives. The bike is a Bajaj Avenger 220CC bikes, modified into two-wheeler ambulances. Previous articleI am your own Belagavi, aka Belgaum, aka Belgao and erstwhile Venugram..
my name is nadeem jardos i am intrested to do this job because i like to save people and i love to help people plzzzzz allow me to help them its a request …… please reply me as soon as possible …..